Not much, except the view once you climbed up the steep steps to get there. I was picked up right at the port by the owner and driven the short distance to the apartments. She was very friendly and gave me tips about the island. 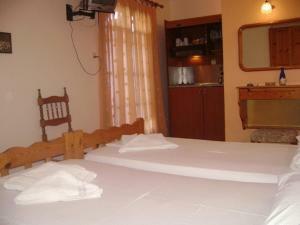 Room was large and comfortable, and a great location right off the main street. The room was big, light and great view of the sea. Close to everything. Amazing view from the balcony. 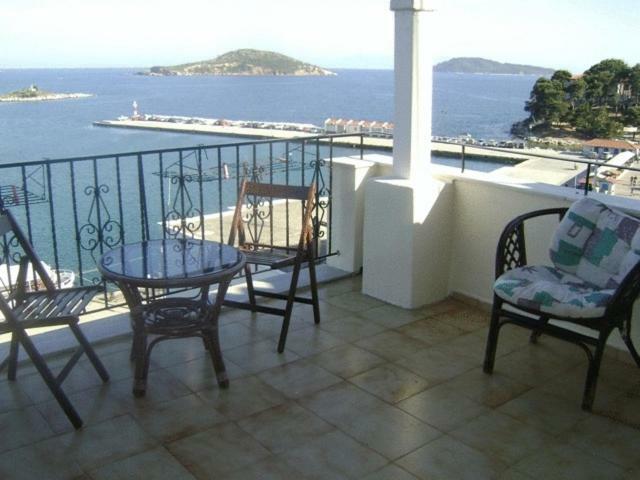 The apartment has a perfectly located terrace with great views of the port of Skiathos. No nigth noise! 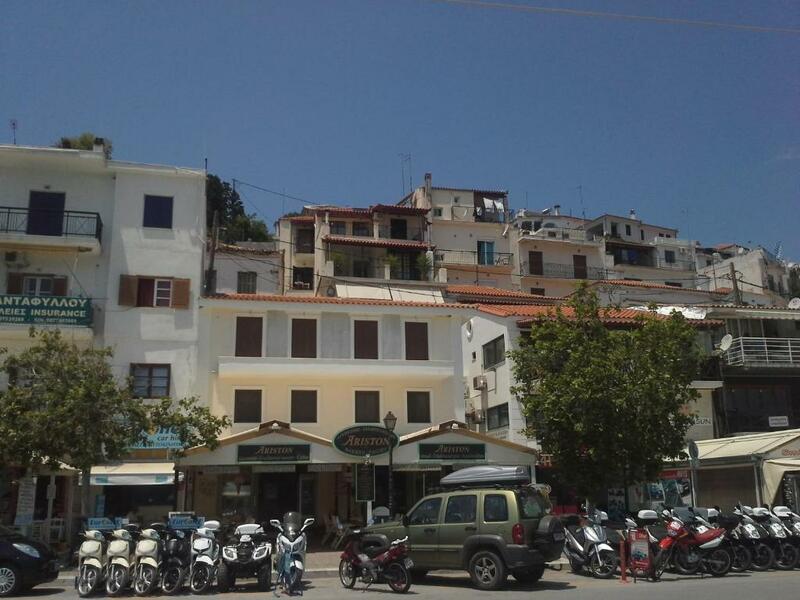 The WiFi is good and the location is perfect, on the port of Skiathos. The madame was just great in everything. The place was lovely. Very flexible with check in time. Great views from balcony, kitchenette so able to sort my own breakfast. One of our best sellers in Skiathos! 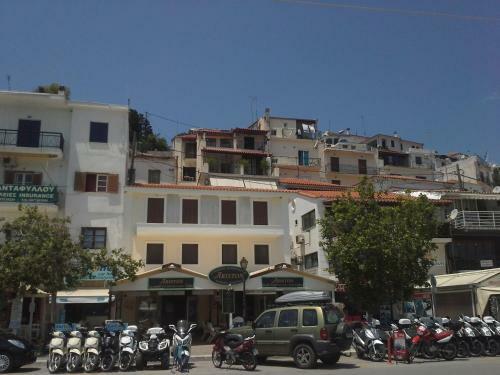 Mahi Studios are located in Skiathos’ capital right opposite the port and the port ticket offices. They offer easy access to Big Sand Beach and Xanemos Beach, only 2,650 feet away. 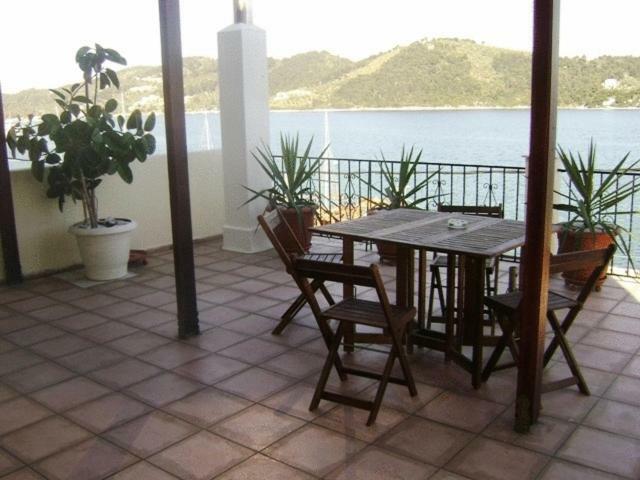 The studios Mahi have private balconies with magnificent views of the sea, the harbor or the City. Some feature a kitchenette. 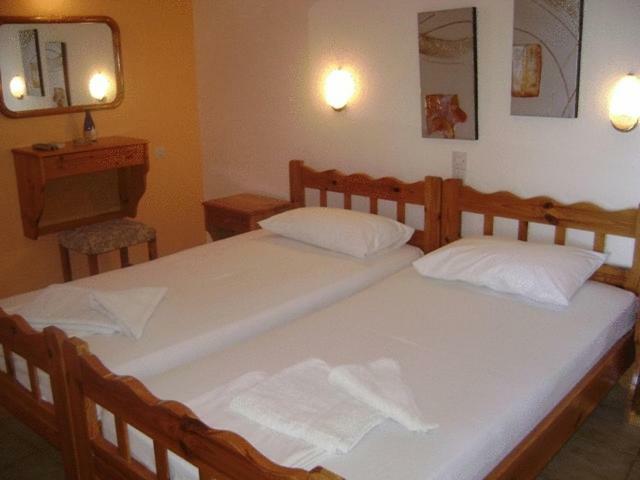 Each includes internet access, air conditioning and TV. Guests can enjoy breakfast on the furnished terrace offering views of the port and Bourtzi. The central bus station is located only 350 feet away. Shops, bars, restaurants and local attractions are within walking distance. 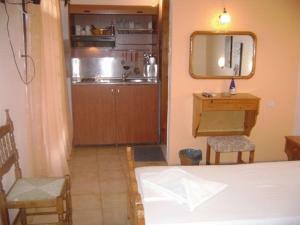 When would you like to stay at Studios Mahi? 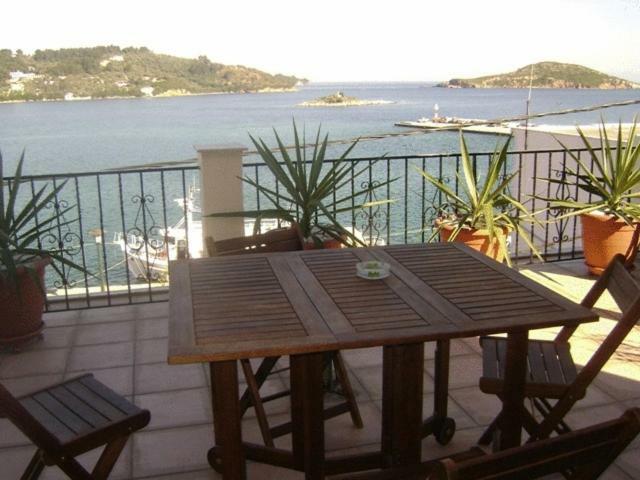 This air-conditioned studio opens to a private balcony with magnificent views of the sea and the harbor or the City. Some feature a kitchenette. House Rules Studios Mahi takes special requests – add in the next step! Studios Mahi accepts these cards and reserves the right to temporarily hold an amount prior to arrival. Please inform Studios Mahi of your expected arrival time in advance. You can use the Special Requests box when booking, or contact the property directly using the contact details in your confirmation. There could have been some shower gel or shampoo. The place was a littler tired and, in my opinion, needed some live and care. The smell from the bathroom was terrible and was really making me sick. On arrival we were informed that there was a problem with the bathroom in Studio Mahi. We had to walk about 10 minutes with our luggage to an alternative apartment. This was in fact a small, dark room - the tiny bathroom had no loo paper. We booked 2 studios with ballkonies and privat bathrooms view to the port. We got an apartment with 2 rooms and a common bathroom and kitchen view to the street at the basement. The space was very small but perfectly adequate for our stay of one night. I was in Greece many times and I have never experienced such a terrible host lady like this. She was absolutely not helpful. The worst thing was that we didn't get what we booked before. We booked sea views and we got a room which looked on the street, and then the lady tried to explain that it is because of my arrival with car. She said I could not get sea views because she gave me private parking, but I did not ask her private parking. No fresh water in the apartman, only salty! If you can avoid this place, do it. The room is too small with shared balcony. The bathroom could hardly fit one person. There is only fridge in the room, there aren't any other kitchenette, no shampoo and no shower gel so you have to take your own. No space for the luggage in the room. We arrived early in the morning and we there was nowhere to leave our luggage until the check in. Some of the things mentioned in the "included list" were missing, like the Bottle of water and the kitchen! Even if the place is well located,ia not handicapped friendly.You have to climb some stairs(that was not a problem for me,if i did not had climbed the Agios Ionnis hill the day before) The applienced needs a upgrade (the small oven it was rusty)And what annoyed most it was the shortage of water.Is not my first time in Skiathos/Skopelos and it was the first time i heard of such “water problem’.And i have been in a hotel almost in the same place,with no water shortage at all, Same with air conditioner.. For the price,you have a better options in the port..funny thing,there is a laundry just down the street.. Another thing,you have to buy dishsoap and sponge is you like to wash the dishes and wipe the floor before you leave..all others places/cities in Greece offers you some cleaning stuff(if is a studio)And i have to wash the dishes/plates with my bottled water today..because there is no “water” I don’t like to write a negative review,and i know that Greece is in a very delicate economic moment.But for the price,those small mistekes could be avoided! I would add a mop and some dish washing tools. Very small. The shower was in the W.C. and was uncomfortable. The view was wonderful from the room.